Randy Cassingham, founder of This is True and the meme site Randy’s Random. In the warmup, Randy was in Las Vegas for meetings and, while there, attended a friend’s wedding — and there were NO Elvis impersonators involved! Kevin digitized several Super Mario Bros. 45 RPM records from 1986 (archive.org, and here’s the beautiful string quartet version in waltz time), and received and archived the unreleased Atari 800 game Leafer Madness. And Gary has started making a new online course on iCloud. Randy says today (January 28) is National Privacy Day, which is even recognized by the U.S. Congress (in a non-binding resolution). There is also National Cyber Security Awareness Month each October, but he, um, wasn’t previously aware of that. Similarly, Leo learned of World Backup Day only a year or two ago. Leo ranted a little about misleading headlines — so misleading that readers end up making poor decisions regarding two-factor authentication. The headlines? That two-factor has been hacked (oh noes!). The reality? It’s just not that easy and two-factor remains a solid and important addition to your security arsenal. (Example from CNBC) 2FA is still much more secure than any login without it. That led to Kevin telling a story about his kid’s Roblox gaming platform account being hacked, and how he managed to get it back (with a hilarious surprise). Sleeping on Twitch: 1.9 million views. Kevin discussed a newly discovered FaceTime bug that allows callers to eavesdrop before the call connects, which Apple promises to fix quickly. 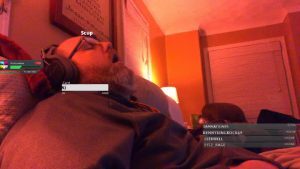 Meanwhile, a Twitch streamer fell asleep mid-stream, and woke up to find hundreds of people watching him sleep (see screencap). As of now, 1.9 million people have checked out the video. Randy reports on a new trend: Samsung Electronics promises to use more environmentally friendly packaging for its products by 2020 (Android Police). Leo notes Loop is trying to do more sustainable package materials, even for things like ice cream (Engadget). And Randy got a chuckle out of the National Security Agency putting a free cell phone charging station in at the Shmoocon hacker’s conference (“You know you want to try it!”) in a tongue-in-cheek effort to recruit hackers for the agency. (Gizmodo, and see tweet below). interesting story about Kevin’s daughter’s roblox being hacked. it would be interesting to know if the account was something that other people would seem cool. If you have a short name or a popular name, it can be traded for the prestige of having a username like a three-letter name or something similar to that. I used to have an ICQ (remember that?) number that was only 6 characters long and that was eventually stolen because it was popular. My password was very secure so I know it wasn’t guessed.